Some of you may have heard of the recent weird twist that has occurred in the world of non-theists -- the founding of an "atheist church." Life can be tough... It is. Sometimes bad things happen to good people, we have moments of weakness or life just isn't fair. We want The Sunday Assembly to be a house of love and compassion, where, no matter what your situation, you are welcomed, accepted and loved. Which sounds like at least they have the right approach. They have said that if they are successful -- which, thus far, they are, showing a 3000% growth rate in just under ten months -- they will open other Sunday Assemblies elsewhere in England. Their stated goal is to create "a godless assembly in every town, village, and city that wants one." Since I'm an atheist, I'll base this claim on data: Studies have shown that those who go to church are happier, more optimistic, and healthier than others; attending religious services helps kids fight depression and by some (admittedly biased) accounts makes people more charitable. Obviously most atheists won't have a very good time gathering at a church or synagogue or temple where everyone is devoted to praising and beseeching an imaginary being, but if you believe these studies, they could do with attending something like church. Ian Dodd, cofounder of a similar assembly in Los Angeles, said wryly, "The church model has worked really well for a couple of thousand years. What we're trying to do is hold on to the bath water while throwing out the baby Jesus." The friend who sent me the news story about this movement ended his email with, "See you there next Sunday?" My response -- after thanking him for the lead -- was "not very likely, sorry." Which got me thinking why it was that I didn't find this idea immediately attractive. You'd think I would, wouldn't you? 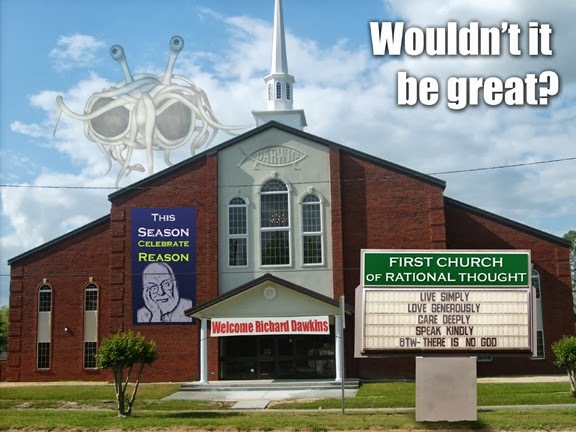 Getting together with a community of like-minded individuals, supporting each other in difficult times, discussing the ramifications of our beliefs (and lack thereof), and so on -- it all should be quite a draw for an "out" atheist like me. And yet I can say with some assurance that if such a "congregation" started in my home town, I probably wouldn't attend. Part of it is personal. I am actually a very shy individual. I'm intensely uncomfortable in large social groups. At parties I'm much more likely to be the guy standing in the corner silently sipping a glass of scotch and watching the goings-on than I am the person at the center of attention. Which is probably part of why I'm a writer, although it does make me wonder sometimes how I ended up in the teaching profession. But it's more than that, and I think that the additional reasons are going to make it very unlikely that the Sunday Assemblies will succeed in the long-term. And it has to do with what brings churchgoers together in the first place. Churches cohere as institutions, I think, because of a commonality of belief and the shared acceptance of a set of core values. Now, there can be disagreement about the details, and sometimes even serious argument; but there is a set of unquestioned assumptions at the basis of belief, and those are generally universal to all members. It's hard to see how disbelief could provide the same kind of philosophical and social glue. There are, after all, a great many more versions and gradations of disbelief than there are of belief. If you think that Jesus rose from the dead to save us from original sin -- well, you can differ in the interpretation of what exactly that means, but the basic concept is the same for everyone. But why do people disbelieve in that claim? I know people who reject the central tenet of Christianity because (1) they don't like a lot of the Christians they know, and don't want to be associated with Christianity because of it; (2) they would rather there not be an all-knowing, all-seeing deity watching them and judging their actions; (3) they figure that if they believed, they'd be compelled to go to church, and like to have their Sundays free; and (4) they just don't give a damn about the whole argument, and prefer not to think about it at all. All of the above consider themselves atheists -- and, frankly, I doubt they'd have much to say to one another about it. As for me, of course, my objections to the core beliefs of religion come from a different source still -- the lack of evidence for religious belief. So it's hard to see how you could base a "church" (or whatever you want to call it) around not believing in something. It'd be a little like having a bunch of guys who get together every week so they can eat pizza and not watch football. So my suspicion is that the whole thing will be short-lived, because groups need a common purpose to survive, not just a shared lack of identification. There's only one common purpose I can think of that an atheist gathering could have that would induce them to hang together -- the purpose of proselytization. Spreading the good word that there's no Good Word. Sending out missionaries to induce religious people to deconvert. And once again -- I have no interest whatsoever in this. To me, belief (or disbelief) is an intensely personal decision. I am, obviously, up front about my own atheism, and have no problem with describing how I arrived where I am philosophically. On the other hand, by doing so I am honestly not trying to talk anyone into, or out of, anything. Proselytization implies an unequal power structure -- "I know what is correct, and I will instruct you about it if you will just open your mind and listen." There's an undercurrent of condescension there that I find repellent. So I'd be happy to discuss what I think, with anyone who isn't inclined to pull out a machete when they find out I'm an atheist -- but I'm just really not into persuasion. So I think I'll be staying home next Sunday. Happy for you if you like this sort of thing, but not my cup of tea. 1. The church is leased on a monthy basis, not purchased. Stating it was purchased suggests that the Sunday Assembly have funding when they are a non-profit organisation who have been running at a loss since they began. 2. There are already a number of assemblies in England, Australia, and America. The expansion in November is simply to open more, not to begin expanding. I know it's been said in every article written on Sunday Assembly thus far, but they gather to celebrate life under the motto 'Live Better, Help Often, Wonder More'. Thanks for the corrections. And just for the record, I wasn't trying to imply that the Sunday Assembly WAS proselytizing; simply that this becomes the raison d'etre for a lot of groups that are taking their model from religion. Unfortunately, there isn't anything like this anywhere near me -- so your suggestion to attend despite my hesitancy isn't going to work, at least not for the time being. In either case, I appreciate your response. I dunno Gordon. Perhaps its because I identify as an agnostic rather than an atheist, but I derive tremendous satisfaction from congregating (usually unintentionally) with other atheists and agnostics. As you may remember from AP bio/ES, I have a LOT to talk about, but its usually challenging to engage people in conversation about religion and its impacts on the globe without provoking their defense mechanisms. It might be nice to walk into a room and recognize that many of the people there are likely to be rational, intelligent, and open-minded. I'm beginning to think, from the responses I've gotten, that my reaction to this isn't typical! I think that perhaps I hadn't credited enough how much my introversion/shyness plays into all of this. Despite my being an outspoken atheist, I really would have no inclination at all to be part of something like this. Funny how our own blind spots sometimes play into our perceptions -- I really didn't realize how unusual I was in this regard. When I said I would see you on Sunday I was being facetious. I am very much an introvert, and as such, this activity does not appeal to me, either. Having watched a collection of youtube videos about this congregation in action, I feel that my mind would be more expanded at home, on Sunday, watching youtube videos of Scishow, Veritasium, Minutephysics, Vsauce, Smarter Every Day... the list goes on. And you summed it up quite well with "There's an undercurrent of condescension there that I find repellent." No offense to Mr. Jones or Ms. Evans... I just don't believe they have anything revelatory to tell me and the only other reason for going (community), I've already described above. In spite of my personal feelings, on a social level, I applaud any movement that draws people away from myth and into reality. If they manage to foment this organization into something that grows and maintains good social standing... and the purpose is still evident (I'm talkin 5 or so years), I will show my support monetarily. Offers more of Susan Cain's data on introversion.